The crew at Yamaha must get restless in the winter as well, and their yearly cure is to throw a party in the desert and invite the media out for a few days of riding their awesome sport ATV lineup. A couple days in the sun playing on some of our favorite ATVs was exactly what we needed, and there was no way we could turn down the invitation! Waiting for us was a fleet of Special Edition Raptors and YFZs. All ATV manufacturers offer sport ATVs, some with more models than Yamaha, and some with a few less, but the design approach Yamaha takes across their lineup is unique. We’ve designed enough products to know that at the start of any project a list of goals is developed, and the longer the list, the more generic the model becomes. It’s impossible to design one vehicle that excels in every type of terrain, for every rider, all of varying size and skill level, but that is a trap many OEMS fall into as they try to maximize sales. The result of trying to be perfect in all areas is always a compromise and a final product that excels at almost nothing. Yamaha’s approach was to pick key features and traits for each model, excel in those, and not worry about being perfect in every area. The result is easily the best overall sport / performance ATV lineup from any manufacturer. Looking for big power and performance? Try and beat the Raptor 700! Ready to hit the motocross track? Better take the YFZ 450R. Just getting into true sport riding and don’t want a warmed over utility quad? You can do no better than the Raptor 250. All three models are the result of focused design with clear goals, and while unapologetically not perfect in every situation, they are all without a doubt at the top of their class. Yamaha’s Raptor 700R was an instant hit from the moment it was introduced, and since that time it has received upgrades that make it even more potent. While other 700cc sport ATVs have been introduced since, nothing has come close to challenging the blue bike in overall performance. In fact, for experienced riders, we believe the Raptor 700R to be the best ATV ever built for the dunes, desert, or for play riding in much of the country. This is not a claim we make without considerable thought since there have been many excellent ATVs we’ve been happy to throw a leg over. However, based on power, a massive but predictable power band mated to forgiving handling, and general overall performance, there has been nothing that can challenge the Raptor 700. This includes Yamaha’s own YFZ 450, the Banshee, and going way back, even the Suzuki QuadRacer 500 and Honda’s legendary 250R. The Raptor 700R is the ATV we’ll pick every time for all day play riding. We’ve always liked the looks of the Raptor 700R. It’s bold, sporty, muscular, and seemingly ready for action. Climb aboard and everything feels perfectly placed. The narrow tank is perfect for sport riding, and the seat offers an aggressive position for charging ahead, yet is comfortable for all day trail rides. Handlebars are exactly where they should be, and there is plenty of room between the seat and the pegs. Just ahead of the steering column, there is even a lighted digital panel that displays all the information a rider needs. The real pleasure from the Raptor 700 comes when you fire it up, however. A throaty exhaust snarl lets you both feel and hear the engine, and as you effortlessly slip through the gears on your way to the largest dunes, you feel as if you’re riding with Thor the God of Thunder, and the thumb throttle is his lightning bolt. With an EFI system powering 700cc of instant revs, there is seemingly nothing you cannot conquer, and the engine has an absolutely astronomical torque curve. Feel free to lug it in any gear; the engine simply refuses to give up! Regardless of the speed, the Raptor 700R is also amazingly stable and confidence inspiring. In the air, the Raptor flew like a bird (albeit a large one), with a very neutral position even though it is a big bore quad with a heavier overall weight. Takeoffs were very predictable, and the only time the extra weight was ever noticed was upon landings. Pitching it sideways in the sand is easier accomplished with throttle control rather than body position, and through the whoops the Raptor tracked very well, which is expected since much of the geometry is identical to the race winning YFZ 450. When Yamaha engineers designed the chassis for the Raptor 700R they again broke new ground with a hybrid chassis. The rear of the main frame is built from forged and cast aluminum, while the front remains traditional round steel tubing! Mating the two materials together by welding is impossible, and the halves are attached by high strength fasteners. One feature we really like is how the bodywork fills in the void below the easy access air box and above the swing arm for a very clean look. This cast aluminum swing arm also gets an eccentric-style carrier for easier chain adjustment, a familiar linkage, and a single-piston brake with a large diameter piston and an oversized pad for excellent stopping power. We’re not exactly in love with the Raptor 700R tires, however. Although they are meant to work well on both clay loam and sand, at times we could feel them slide instead of holding their line, and most riders will want an aftermarket tire better suited to their riding area. The engineering crew at Yamaha wasn’t messing around when they came up with the Raptor 700R. It’s an easy to ride, top of the line bird of prey designed to run down all other performance ATVs and make them cower. Whether in standard trim or equipped with the Special Edition package which offers a wave rear brake rotor, special graphics, and beefy aluminum front bumper and heel guards, the Raptor 700R delivers an adrenaline shot to the spine and creates off-road addicts. We can’t wait for our next ‘fix”! If Webster ever chose to include a definition for ATV Play, we’re confident that immediately next to it would be a photo of a Yamaha Raptor 250. Though nowhere near its big brothers, the Raptor 700 or the YFZ 450, in power or physical size, it actually exceeds both in one important category: the “fun factor”! We’ve watched many highly experienced racers, from top level pros, to magazine journalists and test riders, climb aboard the Raptor 250 and not get off until they either wore themselves out, or they “got off” the hard way. Regardless of when or even how they got off, the one common factor with all of them is that they came away with the biggest smile since their 8th birthday party, their first trophy, their first kiss, or their first car. The Raptor 250 is all those wrapped into one slightly smaller package packed to the grips with fun. If you can’t have fun on a Raptor 250, you need another sport. Yamaha’s focused design approach was well served with the Raptor 250. Rather than repackaging a utility based chassis, the Raptor 250 is a no compromises sport ATV from the wheels up. It’s got the racy lines, narrow seat, extremely comfortable ergonomics, chain drive, and sport suspension just like its big brothers, all wrapped in a light weight steel chassis, and powered by a quick revving, 249cc two-valve, four-stroke engine with electric start mated to a five speed gearbox. The most important factor on any sport quad is handling, however, and in this area the Raptor 250 really excels. At only 313 pounds - and over 50 pounds less than the closest competitor- the Raptor flies like the bird of prey it is. Even though the wheelbase is rather short, it doesn’t do anything crazy in the air, and is extremely confidence inspiring for new riders. Just as importantly, the suspension handles the landings with ease, unlike some models in the class which sound more like a bucket of bolts being dropped from a roof. At the rear, a simple direct link shock helps the Raptor skip through the rough stuff, and the front features dual A-arms with preload adjustable shocks. To complete the sport package, disc brakes are used at both ends. Maintenance is a breeze as well with the washable air filter tucked under the seat, the oil filter on the side of the engine, and the super easy eccentric chain adjuster at the rear of the swing arm. It was time for a ride! . Sand riding takes a lot of power, and we wondered how the quarter liter Raptor motor would handle it. It’s one thing to breeze down a trail, but quite another to fight your way through the loose dune sand, and we expected the diminutive Raptor to work its guts out just to keep us up to speed. There was only one way to find out! Once underway the Raptor 250 was much better than expected in the sand, and for less experienced or smaller riders, the Raptor 250 will have no problem roosting through the dunes for days, weeks, and probably years on end. As usual with any group of experienced riders who find themselves on Raptor 250’s though, an impromptu race broke out! As the fleet of Raptor 250’s was gobbled up by the highly experienced journalists on hand, a makeshift race course that wound between the scrub brush of the desert began to take shape, and before long riders began to fall in line. It was an absolute BLAST to challenge each other around the course, dicing and weaving for position, all the while asking the most out of the highly nimble and surprisingly peppy Raptor 250 engine. Without fail, as tired racers pulled to the side, each one revealed a HUGE smile, and as quickly as they rolled to a stop another rider sped away on the same machine, eager to get into the action. We were a little too eager at one point, however, and as we attempted an outside pass, we clipped a bush and the sand pile hiding underneath, and over the bars we went. No worse for wear, within seconds we were back on the gas and trying to catch up with the leader, and even with a little extra sand now in our helmet, we were still having a blast. Our unofficial race again illustrates the “fun factor” the Raptor 250 inspires every time out. Our original statement about the Raptor 250 still rings true today. There has never been a better ATV for new sport riders than the Raptor 250. It looks great, handles excellent, is super comfortable to ride, and offers a power band that is easy to control, yet strong enough to give newer riders a thrill. We love it! Completing the third leg of the Yamaha sport ATV triangle is the awesome YFZ 450R. Fresh off a major revision only little more than a year ago, the YFZ 450R picks up where the ground breaking original YFZ 450 left off. Similar to its bigger brother, the Raptor 700R, the YFZ 450R utilizes massive cast aluminum main spars from the foot pegs on up, and the entire front end of the YFZ 450R is one continuous casting bolted to the rear portion. To retain flexibility, both lower frame rails and cross members are tubular steel, but at the rear Yamaha again chose to go with their cast aluminum subframe, and a cast swingarm. Long travel suspension is found at both ends, along with a set of competition ready shocks with a huge amount of adjustability. What it adds up to is a front suspension with 9.8 inches of travel, and a rear suspension offering 11 inches of wheel travel. The motor of the YFZ 450R is an all new 449cc EFI equipped power plant, and from the castings on up nearly everything is designed for the rigors of ATV racing. The castings, crankshaft, gearbox, bearings and head have all been beefed up for increased performance and ultimate reliability. Gone is the external oil tank, and now the oil reservoir is built into the lower end of the engine. Power output of the new engine is phenomenal, but like the raptor 700R is still predictable and easy to control. In the sand the new engine offered more than enough power to conquer any dunes with ease, and it was a blast to race up the face, turn just under the crest, and launch roost behind as you rocketed through the bowl. The YFZ 450R may have been designed for the race track, but rider comfort and ease of maintenance were important factors on this model as well. The YFZ 450R bodywork allows a rider to shift their body as needed with little to get in the way. The key was moved to a location just ahead of the steering column, and next to the key is a small indicator light section that warns riders of any engine trouble. At each side of the fuel tank are two large black panels that continue on to the rear fenders, and they can be removed rather easily for maintenance or replacement. One thing most riders will notice is the large “T-bone” seat which is comfortable whether you are perched on top, or when hanging off the side railing a corner. The airbox is found just under the seat and, as usual, it’s easy to access and clean the air filter. Another unique feature is the standard “Pro-Taper” style fat bars, which are mounted on adjustable clamps! Whether in standard trim or with the special edition bodywork, the YFZ 450R is a phenomenal performance ATV. Every aspect of the machine was designed with performance in mind, and it is fully race capable from day one. When not out collecting trophies, it is equally at home playing on the trail or in the dunes, but once past the starting gate, it will practically find its own way around the race course. The YFZ 450R will compliment the skills of all riders, but for an expert level rider, the results can be spectacular. We completely enjoyed our all too short visit to the Glamis dunes and the Yamaha Special Edition YFZ 450R, Raptor 250, and Raptor 700. We’ve always known the Raptor 700 was excellent in the dunes, but sometimes race bikes like the YFZ 450R are not as well suited to all day riding, and smaller displacement ATVs, such as the Raptor 250, can struggle through the power robbing sand. 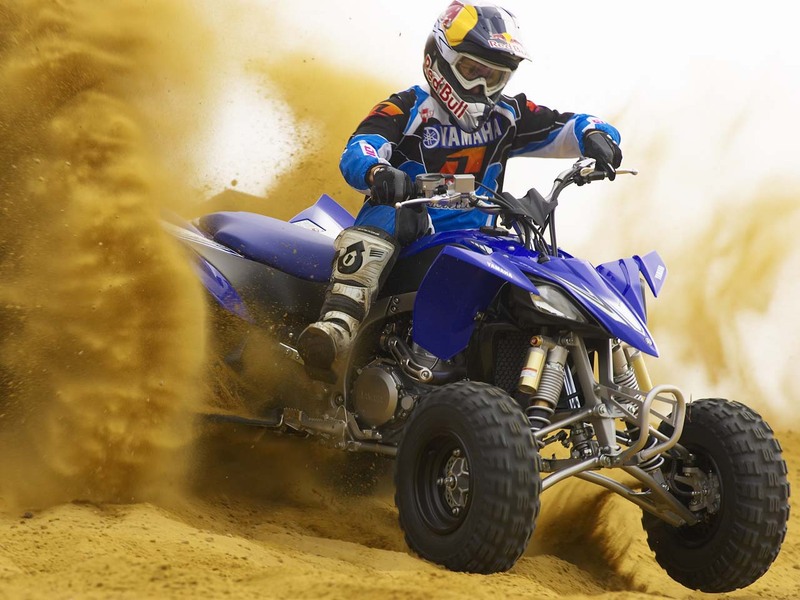 Happily, all three Yamahas were very well suited to dune play and only reinforce our belief that the Yamaha sport / performance ATV lineup is the best in the business.